Mark Groves spoke about 3D localized solutions of the water wave problem. There were two classes of waves of interest, Bond number greater than 1/3 (case A) and Bond number less than 1/3 (case B). In case A the solutions are truly localised, without oscillating tails, and decay algebraically to zero at infinity. In case B, oscillations occur and the decay is exponential to zero at infinity; an example is in the figure above. The appropriate simplified model in case A is steady KP-I, and in case B it is steady elliptic Davey-Stewartson. 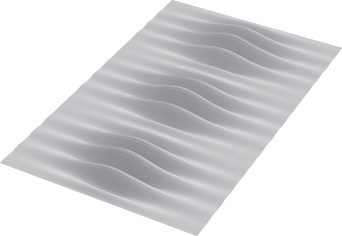 The main part of the talk was to show how the existence of these waves could be proved for the full water wave problem. The range of mathematical tools used were Luke’s Lagrangian variational principle, Lyapunov Centre Theorem in infinite dimensions, Legendre transform, Hamiltonian formulation, concentration compactness, and the fact that non-local terms are quasi-local. A key step was to show that the Lagrangian for the full water wave problem could be written in two parts where the first part is the Lagrangian for KP (as in de Brouard & Saut (1997)) or Davey-Stewartson (as in Cipolatti (1993)) plus a remainder. A byproduct of the proof is validity of steady KP and steady Davey-Stewartson. A recent paper on this theory is Buffoni, Groves, Sun & Wahlen (2013). A video of the talk is available here.